An Original .451" cal. 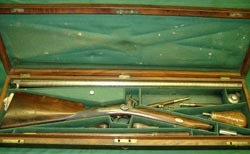 Whitworth rifle in excellent condition and good working order . 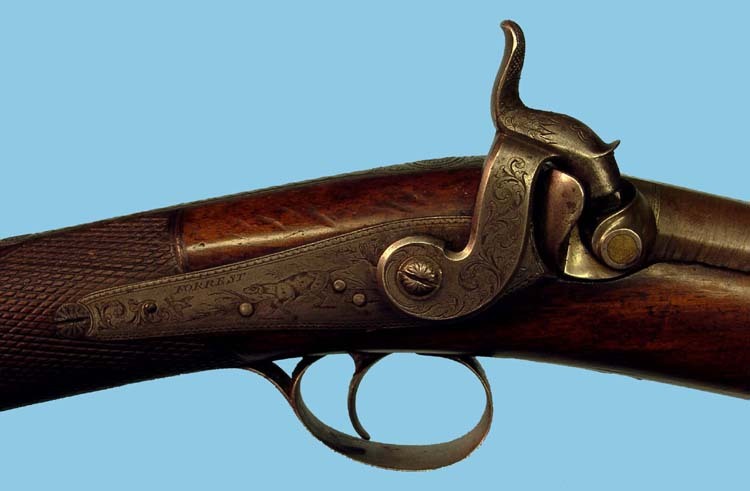 This hexagonal bored WHITWORTH rifle is in excellent condition with a mirror finish bore. The mounts retain much original finish. The full stocked woodwork retains much of its original finish with sharp, crisp chequering. A cased S.B. percussion boys gun by Forrest of Kelso. 20b x 60 cm. browned wrapped barrel engraved Kelso. Back action lock engraved Forrest and hunting scene. Contained in its original mahogany case with original powder flask, rod,oil bottle. Some reproduction tools complete the set. The overall length of his gun is 91 cm. Gun, case and accessories are all in very good condition.